The long, slow slog that is improvement in the labor market continued in July, the Labor Department reported Friday. For many job seekers, that means the difficulty many have experienced in landing a new position remains. As the Labor Department reported, employers added 163,000 jobs last month -- far more than the 100,000 forecast and the biggest gain since February. But the nation's unemployment rate ticked up to 8.3 percent. Those seemingly divergent moves are caused in part by more job seekers reentering the labor market and being counted as unemployed. What's more, the previous month's ebb in layoffs among government workers resumed in July, with 9,000 job cuts. Subtracting those, the economy added 172,000 private-sector positions. The increase largely mirrors results from payroll-services provider ADP on Thursday, showing private companies added 163,000 jobs in July. Automobile manufacturers had fewer seasonal layoffs in July, adding 12,800 jobs during the month for a total of 789,500. That's up nearly 68,000 from a year ago. Overall, most sectors added jobs. That was true especially in manufacturing, health care and the huge service industry. The number of discouraged workers -- those who have given up looking for work -- dropped by 267,000 compared to a year ago, when more than 1.1 million could be counted as discouraged. 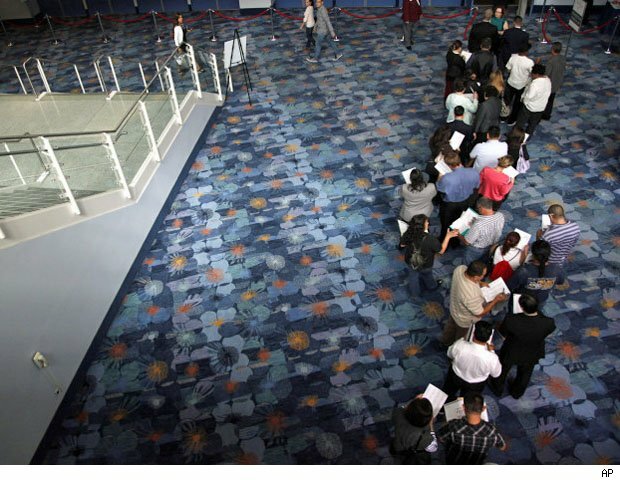 The number of long-term unemployed fell. Those out of work for 6 months or more fell by 185,000 or 3.4 percent. Three years after the Great Recession ended, about 12.8 million people remain unemployed. While July's job gains were a considerable improvement over the past four months, they were well below the average 252,000 jobs a month added from December through February. It's still much too soon to tell whether the country's employment situation will effect President Barack Obama's chances at a second term. As the Associated Press reports, the nation's unemployment rate has been above 8 percent since his first month in office -- the longest stretch on record. No president since World War II has faced re-election with unemployment more than 8 percent. For job seekers the picture is even murkier. Though employers continue to hire, those working in government still appear vulnerable to job loss as state and local governments struggle to balance budgets. In the private sector, employers don't yet appear to be hiring in droves. Their reticence may continue well into the fall until after November's elections, as companies stick to their well-worn wait-and-see approach to hiring.